Bijan is a veteran strategy advisor for the West Asian markets and has over 25 years of strategic consulting experience with global companies. He has a strategic outlook in his consulting work and provides a macro environmental view to investing in new markets, understanding PESTLE structures, and social and investment challenges. He has also been involved in mediation and negotiations of international business and investment partnerships. 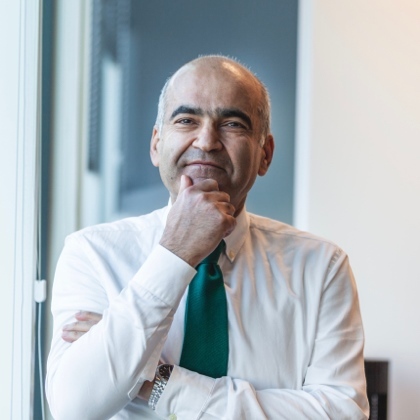 In 1994, Bijan co-founded Atieh Bahar Consulting, which then moved to Vienna in 2010 as Atieh International – the firm that has now been renamed to Eunepa. Bijan has founded and is a Board Member of a number of companies, including Atieh Capital, an independent financial advisory firm in Vienna. Bijan is also a regular speaker at international conference and has been published widely. He is also a member of the advisory board of the European Middle East Research Group (EMERG) and a regular contributor to Al-Monitor. His publications include contributions to The Caspian Region at a Crossroad: Challenges of a New Frontier of Energy and Development (St. Martin’s Press, 2000), Iran at the Crossroads (Palgrave, 2001) Security in the Persian Gulf: Origins, Obstacles, and the Search for Consensus (Palgrave, 2002), L’économie réelle de l’Iran (L’Harmattan, 2014) and Social Change in Post-Khomeini Iran (CIRS, 2015). Bijan undertook his graduate studies in Management and Economy in Germany and the UK and has a DBA from the International School of Management in Paris.